Taylor Hilt Mitchell was born on October 7, 1985 in Providence, RI. From an early age, his passion burned for the stage. At the age of five, he played little Conrad in Bye, Bye Birdie, produced by Fantasyworks, a Rhode Island based Children’s Group directed by Dr. Ann O’Grady. For several years after that, he continued working with "Fantasyworks", playing a cowboy in Oklahoma at the age of seven and then, at the age of eight, a punk in a review entitled Tales from Times Square. At nine, he played Michael in Peter Pan, the mayor of Munchkin city in Wizard of Oz at eleven and at the age of twelve, the knife grinder and one of Fagin’s gang in Oliver. During that time, Taylor became indelibly linked to the University of Rhode Island Theatre department under the direction of Judith Swift, playing Kurt von Trapp in The Sound of Music at age ten, the ensemble in Music Man at age eleven. Under the direction of Robert Melrose, guest director from Yale University School of Drama, Taylor played in the ensemble of A Dream Play at age twelve. At the age of ten, Taylor began his professional career with his involvement in Kaleidoscope Theatre, based in Cranston, Rhode Island. Kaleidoscope Theatre is a non-profit organization that tours five venues around New England with children’s shows in the summer. During the winter season, Kaleidoscope brought shows to elementary and middle schools, teaching about the dangers of drugs and the importance of including people with mental retardation. The first summer Taylor became involved with Kaleidoscope Theatre he was ten years old. Taylor performed in a twenty minute special entitled Sea Babies, which taught the importance of saving and respecting the environment. That same summer, Taylor performed the role of Willie Mouse in Cinderella and was the title role in Pinocchio, a part also played by renowned choreographer/performer, Joey Pizzi, several years prior. Both Cinderella and Pinocchio toured four venues across New England: The Warwick Musical Theatre of Rhode Island, the Cape Cod Melody Tent of Massachusetts, the South Shore Music Circus of Massachusetts, and the Oakdale Theatre of Connecticut. The next summer, Taylor played Baby Bear in Goldilocks and the title role in Jack and the Beanstalk, touring the formerly mentioned venues. 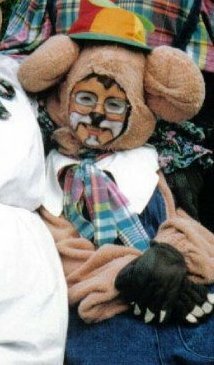 In the winter of his eleventh year, Taylor played the straw pig in The Three Little Pigs. Taking a brief hiatus, he returned at the age of fourteen, playing Peter/Johann in Heidi, reprising the title role in Pinocchio, and playing the Young Prince/Spot in Sleeping Beauty. In the spring of his fifteenth year, Taylor played the young boy in the anti-drug special performance of Bad Company, directed by Carol Cullen and toured several schools throughout Rhode Island. 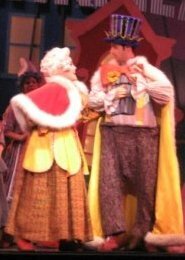 The summer of his sixteenth year was Taylor’s last summer with Kaleidoscope Theatre, playing Candlewick in Pinocchio. Taylor next held a brief stint with A2Z Productions of Rhode Island in their seasonal Jesus Christ, Superstar concert, directed by Susan Arundale and Robert Zanini, featuring the incomparable Carl Anderson, the original Judas in the motion picture as well as the Broadway company. This was followed by the community theatre of East Greenwich, Rhode Island: the Academy Players. Taylor spent several years with them performing in Cabaret (Dancing Gorilla/Ensemble) at the age of thirteen as well as Joseph and the Amazing Technicolor Dreamcoat (Benjamin) at sixteen. Next, Taylor became involved in dinner theatre. City Nights Dinner Theatre in Pawtucket, Rhode Island featured Taylor in On Tidy Endings (Jimmy), The Sound of Music (reprising Kurt von Trapp) and The Wizard of Oz (Ensemble/US Scarecrow). Taylor was also actively involved in his high school company, the LaSalle Academy players. He performed the role of Judas/John the Baptist in Godspell as a freshman, Benjamin in Joseph and the Amazing Technicolor Dreamcoat directed by Lennie Watts as a sophomore, a soloist and dancer in the original cast of the comedia dell’arte style musical Con Amore junior year, and senior year was cast as the Jester in Once upon a Mattress. T. Rome School of Music at The Catholic University of America in Washington D.C. He played part of the ensemble of The Fabulous Fable Factory with CUA Cardinal Children’s Theatre. Taylor was also cast as Louis Schlang in Do Black Patent Leather Shoes Really Reflect Up? and Man #1 in Lucky Stiff through CUA’s Centerstage, the student-produced, directed, and acted organization at CUA. He was also cast in the mainstage shows at Catholic, including playing feeble Otto Kringelein in Grand Hotel, ensemble in Secret Garden, Johnny Johnson, Jacques Brel… Oklahoma, The Tender Land,and, most notably, King Herod in Jesus Christ, Superstar. Upon graduation, Taylor embarked ecstatically, albeit apprehensively, on his performing journey. The catalyst starting at Santa’s Village in Jefferson, NH. 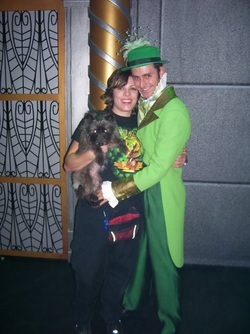 He performed as Tenor the Elf and Tommy the Toy Soldier, garnering the 2007 IAAPA Big E! Award for Best Theme Park Show in the world. A tour around Missouri with The National Theatre for Children was Taylor’s next endeavor. He played the title role, Professor Jack and the Great Waster in “Boomerang Jack and the Unseen Green Machine”. As a featured sailor, Taylor enjoyed Florida and Arizona, touring with the Prather Entertainment Group’s box office smash “Anything Goes”. His second theme park was in Lancaster, PA at Dutch Wonderland, where he was Thomas the Tank Engine’s friend, Engineer Jake and Jester Jimmy in the “Dance-A-Long” party. From 2008-2009, Taylor was cast as the Mayor of Munchkin City and understudied the Tin Man in the first National Tour of “The Wizard of Oz”. He was given a chance to play a dream role, Angel, in Roxy Regional Theatre’s production of "RENT" in the summer of 2009. Following that, Taylor flew down to be a Busker in Arts Center of Coastal Carolina’s production of “My Fair Lady”. In his first New York performance, Taylor was a featured ensemble member of Blume Media Productions “Let My People Come”. He was given an opportunity to play a multitude of roles at Gilroy Gardens, a children’s theme park in the Bay Area of California. “Disney’s Beauty and the Beast” was Taylor’s next foray into the world of performing. In 2011 he played a townsperson, an enchanted object, and understudied the tumbling Carpet in the NETworks Theatrical’s national tour. Taylor worked directly with Broadway director Rob Roth and choreographer Matt West on this stunning production. Throughout Taylor’s life, he has been blessed with amazing people who have supported him in more ways than he can begin to explain. His success is mainly due to that love and comfort he received from all his friends, family, and especially God. He is eternally grateful and appreciative for all God has blessed him with and he is excitedly awaiting more success in the future.